Suitable for custom handling solutions involving load rotation or vacuum gripping and/or special handing controls. Models are available from 80 to 320 kg capacity, including the end effector. It can be applied to different supports such as column with Orbit Arm, ceiling, overhead rail and bridge crane system, Liftruck. 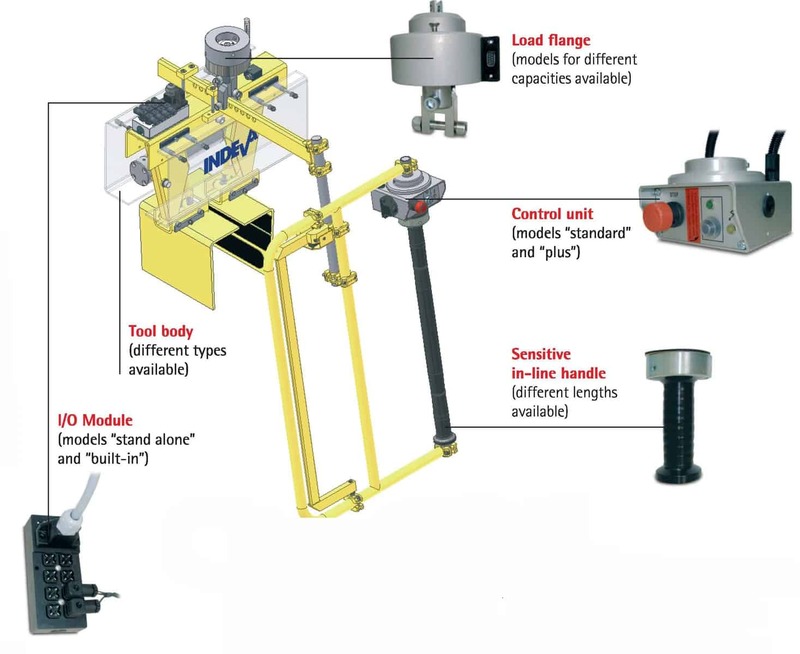 The Liftronic® Pro series manipulators are evolved industrial manipulators belonging to the INDEVA® class (Intelligent Device for Handling). The INDEVA® (or IAD – Intelligent Assist Devices) are electronic zero gravity balancers and represent a new ergonomic solution in material handling, solving today’s urgent need for increased productivity and safety. Thanks to our modular end-effector concept “MODULO” and microprocessor logic, we can design and manufacture tool heads and grippers to suit the exact requirements of our customers in all industrial fields. An intelligent and consistent industrialization process of our end effector modules enable us to ensure proven reliability and efficiency for both custom and standard end effectors.